Integral is a free template from Free CSS Templates released under a Creative Commons Attribution 2.5 License. 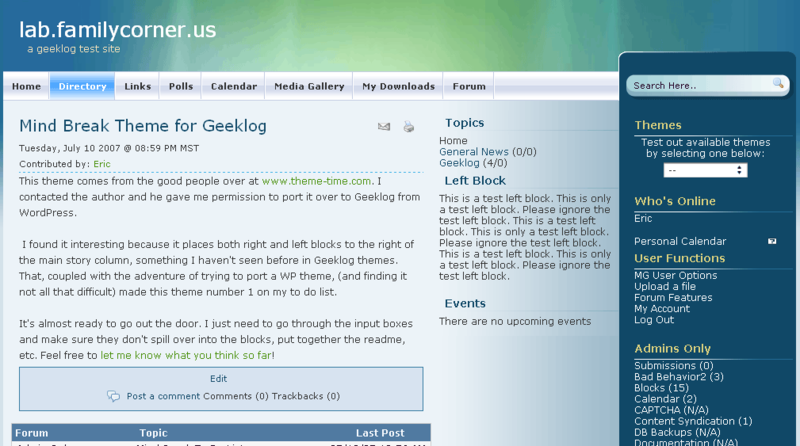 This theme was ported as study for a tutorial on Geeklog Theme porting. Thanks to geiss. It is meant for 1024x768 and higher screen resolutions. I have tested it in Firefox2, and Safari public beta 3. In other browsers, your mileage may vary. Greenery is a fluid width, 3 column layout theme which places both left and right blocks to the right of the main story column. This theme really struck me with the image down the center. It helps to draw your eye down the page. I can visualize some interesting variations where the image will transition into the background color, giving the effect of the end of a brush stroke. You only need to change 2 images and the link colors to give it whatever feel you want. It is meant for 1024x768 and higher screen resolutions. I have tested it in Firefox2 and IE7. In other browsers, your mileage may vary. 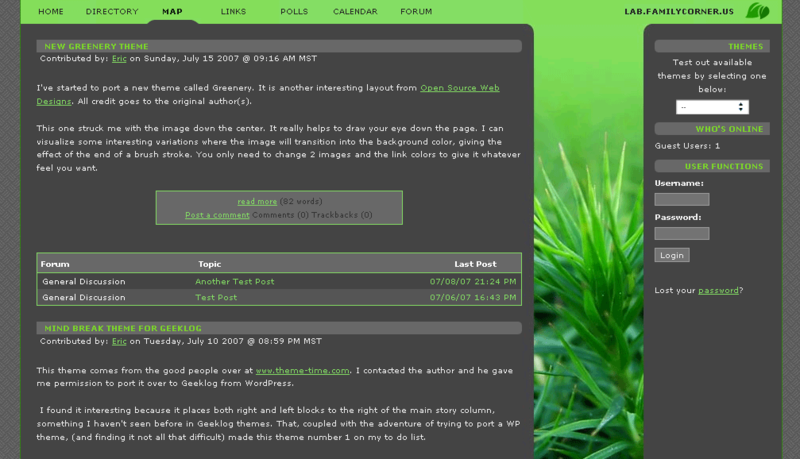 Mind Break is a fixed width, 3 column layout theme I ported with permission from its author at http://www.theme-time.com. I found it interesting because it places both left and right blocks to the right of the main story column. It is meant for 1024x768 and higher screen resolutions. Please see the enclosed README file for more info. meets your needs. See the readme file for more info.